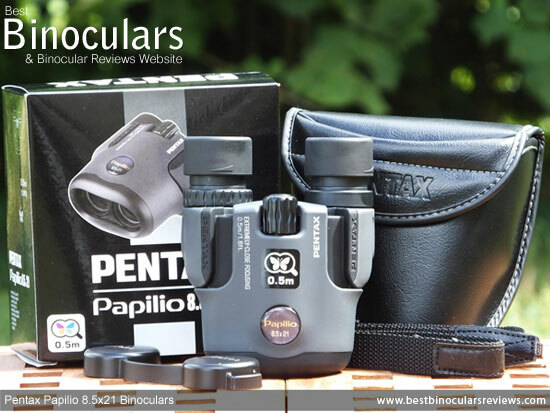 The Pentax Papilio binoculars are a little different than most in that instead of being designed to take a better look at distant objects, (although they still can) they really excel at enabling you have a much better look at objects from close range. Indeed their name, "Papilio" is Latin for butterfly, which was chosen because that is mostly what these have been designed and optimized for observing: things like butterflies, bees, dragonflies and other insects as well as flowers or even birds from closer distances as they have a very near minimum focusing distance of only 1.6ft (49cm). For sometime now I have wanted to try them out as there is not really anything else similar on the market, thus when Pentax contacted me, asking which of their products I would like to test, I jumped at the chance. The overall "delta wing" shape of the body is typical of a compact binocular using reverse porro prisms, meaning that the objective lenses are closer together than the ocular lenses. This results in a smaller package than what most standard porro prisms (with ocular lenses closer than the objectives) can achieve. However other than that, they differ to most similar shaped compacts in that instead of having a single hinge down the middle of the whole body that you open and close to adjust the distance between the eye-pieces, these have what Pentax call a "dual-axis, single body housing". This means that each eye-piece moves on it's own axis, yet they are also connected and synchronized in such a way as to ensure that they move at the same time and by the same amount to maintain their alignment with each other - you can see this in motion in my walk-around video of them at the end of this review. Other than being a good looking design, I am not sure if this structure offers any particular advantages or disadvantages and could be just because of the way the objective lenses move forwards and backwards as you focus to help achieve their incredible minimum focus distance, which I will get to later in the review. 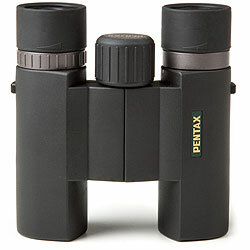 Another difference to this design is that because the objective lenses do not move in relation to each other as you open and close the eye-piece hinges (as what happens on a bino with a single hinge right down the center of the body), Pentax have placed a single piece of glass right over the front to both barrels. This glass is set about 4mm, back from the external housing and on the top is what looks like a sun shade that protrudes out further to about 10mm from the glass surface. This will offer some protection from glare as well as dust and light rain, however I must say that it did not take that long for some tiny specs of dust to settle on this lens whilst I was using them. Pentax do not mention what the chassis is made from, but from a few small parts you can see I would guess that it is some sort of polycarbonate. Whilst this may not be quite as strong as aluminium or magnesium that is also sometimes used, it is cheaper to produce and quite often lighter. Apart from a few small areas, almost the entire body is covered in a reasonably thick, soft rubber coating. This will give the optics a relatively good amount of impact protection and because it is soft, it offers a tacky and very grippy surface to hold onto. 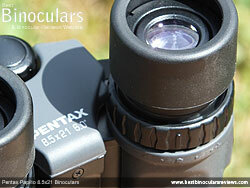 Pentax have also added a thumb indent under each of the barrels and the central spine has also been shaped and curved. I found that for me, with what I would describe as average sized hands for a male, it was most comfortable to have the first bend on my thumbs resting in these thumb indents, with the rest of my fingers folded around the top of the binocular. In this way, they felt well balanced and I was able to hold them really steady for a shake free image. One of the downsides to a porro prism design is that it makes it a little more complicated to completely seal the body, this combined with the individually moving eye-pieces means that on the Papilio this would have been particularly difficult to achieve and as such these are not fully waterproof. The fact that they are not completely airtight also means that they obviously could not remove all the internal air and replace it with a dry gas like nitrogen to make them fogproof. Having said that the outer body and the rubber seals to the optics inside look well made and will provide at least some protection to light moisture and dust. There are not that many compacts that are designed to attach to a tripod, but because of their main intended use, being able to mount them and having them completely steady will be of great use to those who really want to study an object or creature over a long period of time. I can think of scientists or artists who want to make a sketch or painting from nature that would find this particularly useful. 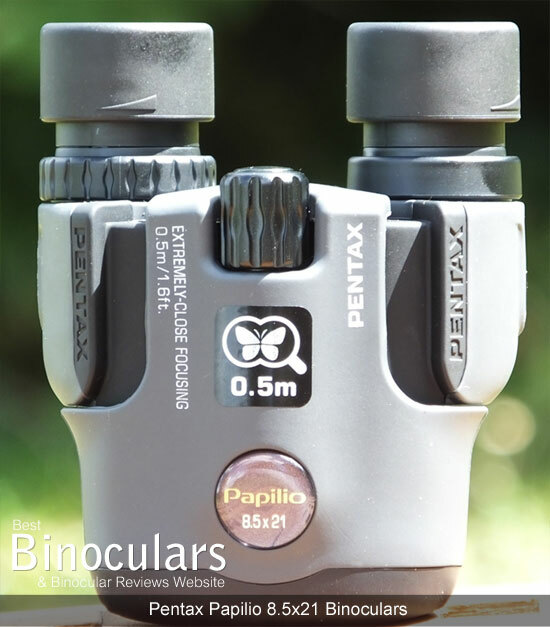 So these Pentax Papilio binoculars have a standard ¼-inch thread to the underside of the body, which you can either screw in a special adapter (purchased separately) that raises the binocular that will in some cases make it little easier to connect to your tripod. Or as I found, I was able to simply screw in my tripod mount and then click it into the tripod head. Note, this may not work with all tripod heads as the recess under the body of the Papilio may prevent the larger heads from fitting, but it did work with my Vanguard GH-100 pistol grip ball head that I often use with my binoculars, scopes and my photography. 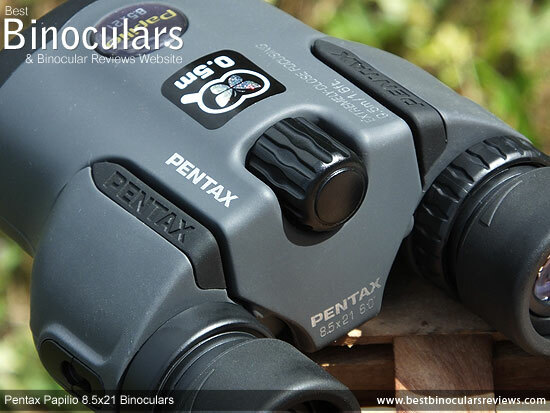 Unlike many binoculars in this class that simply have a rubber eyecup that you can fold up or down to adjust the distance that your eyes sit away from the ocular lenses, the Pentax Papilio binoculars use twist-up eyecups which is far superior. They have three fixed positions: fully out, halfway in between and fully in and come with 15mm of eye-relief, which for a compact is good and should also be just enough to accommodate most people who wear glasses. The mechanisms on the pair I was testing worked really well as they were smooth and locked nicely into the fixed stops. The actual eye-piece housing looks to be made from polycarbonate as is the main body of the eyecup, which has then been covered in a reasonably thick and soft rubber to improve comfort. The eyecup has an external diameter of 33mm and have a 4mm wide surface that you push against your face. Pentax state that the "eye-distance adjustment range" or the Inter-pupillary distance adjustment as being from a minimum of 56mm (2.2in) to a maximum of 74mm (2.9 in), which I can confirm is correct. and is a good range and should accommodate most people. Another point to mention on this adjustment is that the relatively small 2.47mm exit-pupil that is produced by these 8.5x21 Papilio's (21 � 8.5 = 2.47mm) also requires you to make sure that you perfectly line your eyes up with the centers of the ocular lenses when adjusting the IPD. This is because any small deviation results in dark rings forming around the observed image. This is something that I did notice, but fortunately changing the IPD setting on these is simple, accurate and it remains at your desired setting, so once you have perfectly adjusted the eyecups to line up with your eyes this is not really a problem. Whist the way you focus on an object by turning the centrally located focus wheel is pretty much standard, what happens inside the body as you turn the wheel is very different from the norm and is what makes these Pentax Papilio binoculars special and is why they are able to focus at such close distances. You see, the close focus distance on most binoculars is partly restricted by the distance between the objective lenses, because at close distances you get a misalignment of the left and right image fields. This happens because nearby objects have a larger parallax than more distant objects when observed from different positions, which in this case is the two objective lenses. So to overcome this, Pentax have come up with an ingenious system of placing the objective lenses on tracks that are not parallel to each other. So as you turn the wheel to focus on a nearby object the lenses move down the barrels, away from your eyes, but closer to each other. Turning the wheel in the other direction to focus on a more distant object moves the lenses back up the barrels and closer to your eyes, but further apart from each other. Simple but at the same time very clever. The mechanism itself is very smooth and unless you look at the objectives whilst turning the wheel, you would never know that they are moving. It takes just over 3 full turns (1080° of rotation) to focus from one extreme to the other. This is far more than what you find on most binoculars but makes fine tuning your focus onto a nearby butterfly or flower very accurate allowing you to get the sharpest image possible. On the flip side, if you suddenly spot an eagle high up in a tree, it takes relatively longer to adjust the focus over longer distances. At 17mm in diameter, the focus wheel itself is pretty small in comparison to a full sized bin, but matches that of most compact porro prism binoculars. Whilst it turns easily enough, this small size and the fact that it does not stick out much from the top of the body can make accurate adjustments a little more difficult whilst wearing thick winter gloves. 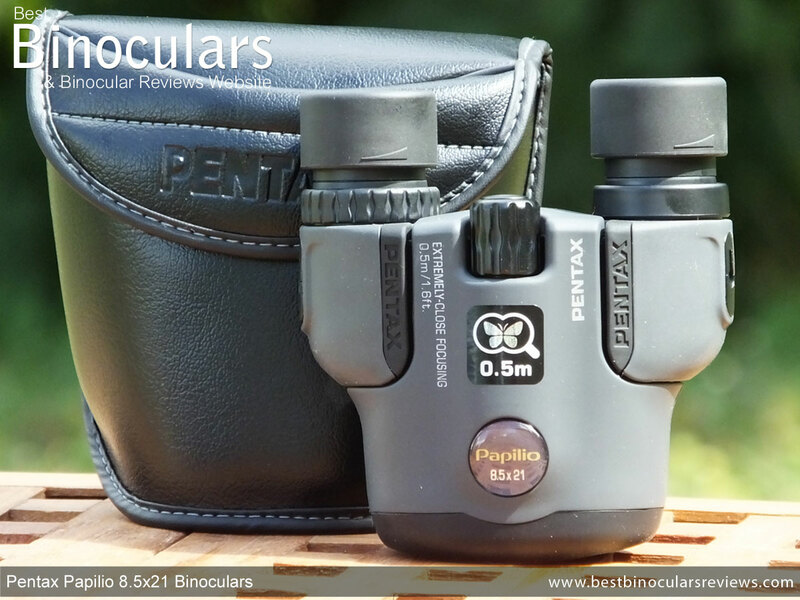 To adjust the diopter setting on the Pentax Papillio, you simply turn the ring located on the on the right ocular housing which has a range of between +4 and -4. This is used to adjust the two different barrels separately so that they can compensate for any differences between the vision in your left and right eyes. 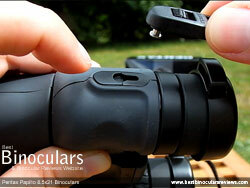 Take a look at this article on calibrating & focusing your binoculars for more on this. Even though this ring on this Papilio is not lockable, it does have a series of fine, closely-spaced click-stops that helps prevent unwanted movement and which is an improvement on most in this price range that turn without any stops. Pentax have also included far more markings than on most, which you can use to remember and quickly return to, should your setting not be neutral and it gets altered either accidentally or when sharing your bins. Their dimensions are fairly standard for a compact porro prism binocular, but as you can see from the table above roof prism compacts tend to be a little shallower, even with their larger objective lenses. If you are looking for the most compact binocular possible, it is important to consider just how small they will be when folded up. 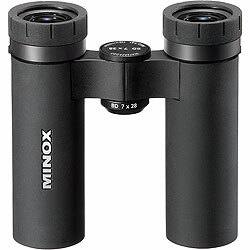 The advertised width of 10.9cm is the measurement with the distance between the eyepieces set to maximum, folding these inwards reduces their width to 9cm. However this does add make their height move out to 6.5cm. 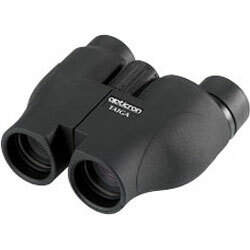 Some compact roof prism binoculars feature a duel hinge design (like the Steiner's pictured below right) that enables them to fold up into a very small package which can easily fit into your pocket when not in use. However because of the added height and not being able to fold up into quite as small a package, you could not describe these or indeed most other compact porro prisms as pocket binoculars. 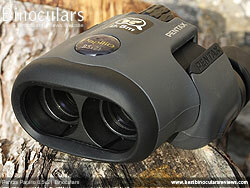 For more on these design and size differences take a look at this article I wrote on compact pocket binoculars. Their weight of 10.2oz (290g) is once again reasonably similar to most other compacts, which as you would expect is also quite a lot lighter than larger full-sized devices. The eye-piece lenses are 15mm in diameter, which as you would expect is a fair bit smaller than what you find on full sized bins, but is about the same as on most other compacts in this class. Pentax also mention that the eyepiece is made up of 5 elements in 5 groups, which does sound complex but does not automatically mean that they are better than simpler designs. Pentax state that their Papilio's have "aspherical optical elements" - aspheric lenses are basically lenses that don't have a constant curvature are thus not perfectly spherical. 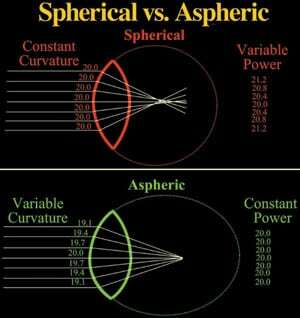 The potential advantage of this lens design over a simple spherical lens is that made correctly, these different degrees of curvature can bend the light by different amounts and so make them focus on exactly the same point and so can completely get rid of, or at least reduce some aberrations, including spherical aberration. 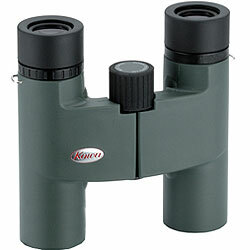 Many higher end binoculars use complex lenses that are made from multiple lens elements, which are often also made from different glasses and different shapes to help better direct the light. With a more simple aspheric lens, it is possible to achieve the same result, but also results in a lens that can be smaller, lighter as well as cheaper, which for a compact like this is ideal. However it is important to realize that just because Pentax have used "aspherical optical elements" as they call them, it does not automatically mean they are better. You can get cheap aspheric lenses that are made by pouring the glass into a mould, which is obviously much simpler and cheaper to produce than the superior method of grinding them. Top grade ground aspherical lenses can produce incredible results, but are complicated and difficult to make. We have already discussed that the relatively small 21mm objectives mean that they have less area with which to capture light with than larger ones would. But this is not the whole story as a bright as well as good quality image requires as much of this potential light has to go right through the optical system and into your eyes. One way to improve this transmittance level is to add anti-reflection coatings to the lenses which help to prevent light being reflected away from the glass surface. 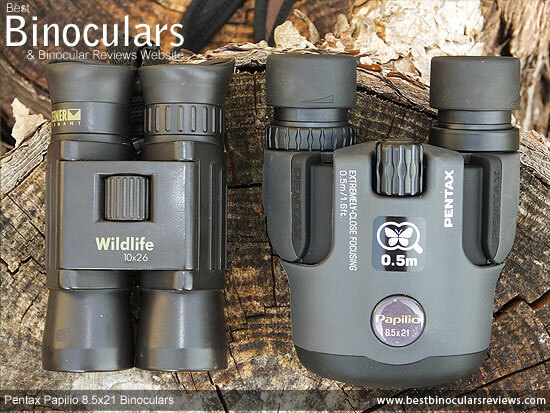 The quality and amount of these coatings that are used are very important and can make a large difference to the amount of light that is transmitted and it is one of the main reasons why I have on numerous occasions noticed a smaller binocular outperforming or at least equalling one with larger objectives. The Pentax 8.5x21 Papilio comes with fully multi-coated optics which is excellent as it means all of the outer surfaces of their lenses have more than one layer of these anti-reflection coatings applied to them. What is also impressive and worth mentioning is that many other bins in this size and price range will only have one layer on all or even just some of the surfaces which you can see on the comparison table below. 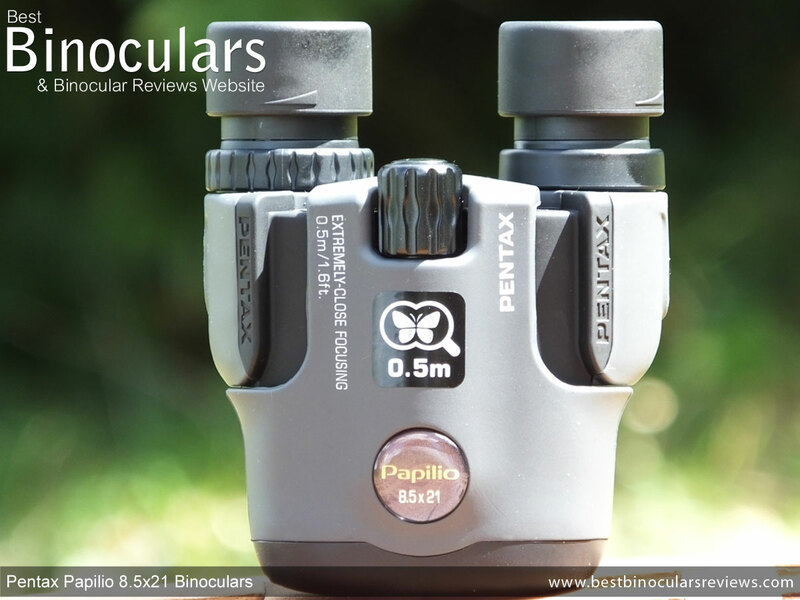 The Pentax Papilio binoculars use reverse porro prisms made from BaK-4 glass which in most cases is more desirable and outperforms BK7 glass. Porro prisms have a number of advantages including the fact that all the light is reflected off the prism surfaces meaning that they don't require highly reflective coatings added to them as is the case on roof prisms. Likewise no phase shift occurs using a porro prism, so no phase correction coatings are required. With an angle of view of 6.0° the width of the view through the 8.5x21 Pentax Papilio is 315ft wide at 1000 yards (105m @ 1000m). This is actually pretty good for a compact, even when you compare them to other 8x compacts that have a slightly lower magnification. However if a wide FOV is important to you, for example if whatever it is that you are mostly wanting to observe is fast moving and difficult to follow, you may want to consider dropping a little power in exchange for a wider view. This is where the 6.5x21 Pentax Papilio has an advantage over these. 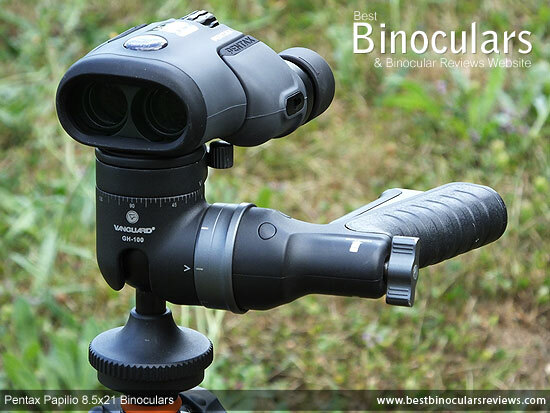 At only 1.6 feet (0.5 m), the minimum close focus distance is where to my knowledge these Papilio binoculars completely outperform any other binocular on the market and is what makes them unique and the ideal binocular for close object observation. The minimum focussing distance of any binocular is largely dependant on the physical position of the objective lenses in relation to each other. 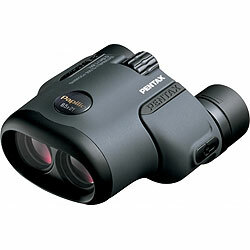 To improve on this limitation, Pentax have developed a system where as you turn the focusing wheel to bring the focus towards you, the objective lenses, which are on tracks, actually move closer together and this is how they are able to achieve a perfectly in focus image at such a short distance on a pair of binoculars. For a complete explanation and demonstration video on this unique and somewhat ingenious solution look at the section above on focusing. As you can also see from the table above, the 15mm of eye-relief is pretty good for a compact and whilst it may not match the very long eye-relief's on some full sized binoculars, it should just be enough for most people to use them with glasses on. With all my reviews, including this one, I put the binocular under review through a number of comparison tests with that of my similar class control binoculars. It is in this way that I am able to judge them against these and make what I hope is as accurate and objective opinion as possible. 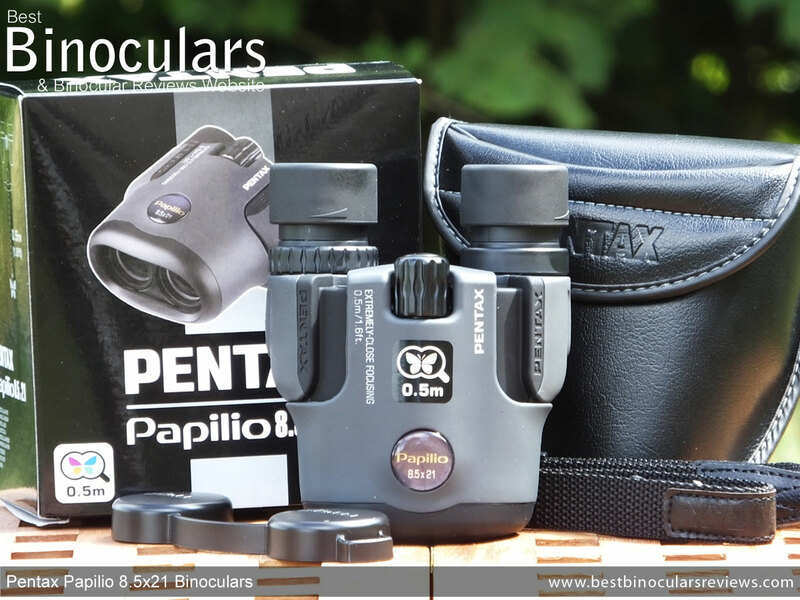 As I don't have a 8.5x21 control binocular, I compared these Pentax Papilio's to my 8x and 10x26 control compacts as well as my 8x32 mid sized binoculars. The following tests were carried out twice, once in good light and again when the light was poor to very poor at and after sunset. In good light, I was not able to notice any difference between these and both of my compact controls even though both of these have slightly larger exit pupils. I was however able to se a slight improvement in image brightness on my 8x32 binoculars which have a much bigger 4mm exit pupil. In low light the difference in brightness between all of the compacts and the mid sized binocular was noticeable, but still the difference between these and my other compacts was undetectable to my eyes. This interesting and I am sure that it must be features like the fully multi-coated optics on the Papilio as opposed to only multi-coated optics on many similar porro prism compacts that make up for the smaller area of the 22mm objective lenses. So based on my experience I would rate their image brightness as good to very good, when compared to other compact bins in this price range. Higher spec compacts, with larger objectives and the highest quality optics do perform slightly better, but then they also cost a whole lot more. The colors produced look natural and when you focus in on a beautiful flower for example look every bit as vivid as on any binocular I have looked through and really help to bring what your looking at to life. I also thought the contrast was good, which helps objects to jump out at you and gives the image a nice feeling of depth. My test for color fringing is to focus on the edges of objects that contrast with that of their background. Whilst it is still sometimes hard to see, binoculars that don't eliminate chromatic aberration produce an image that has color fringing on the edges of these objects. With the Papilio, there was some small amount of color fringing present, but it is very minimal and you can only really notice it when looking for it very closely. This amount is in my experience nothing to worry about and is about as much or less than most others in this class. Whilst these is some image softening right at the edges of the view, once again it is very minimal and is actually less than what I would expect in this class and price range. I was also impressed with the flatness of the image across the whole field of view. My test for depth of view is to focus on an object about 5m away and then take the view past that (without altering the focus) as far as it can go before the image becomes blurry and out of focus. I though the depth was as good as my other 8x controls and so rank them above average, which considering that these have such a wide focal range is impressive as I was half expecting them to have a very poor depth of focus. 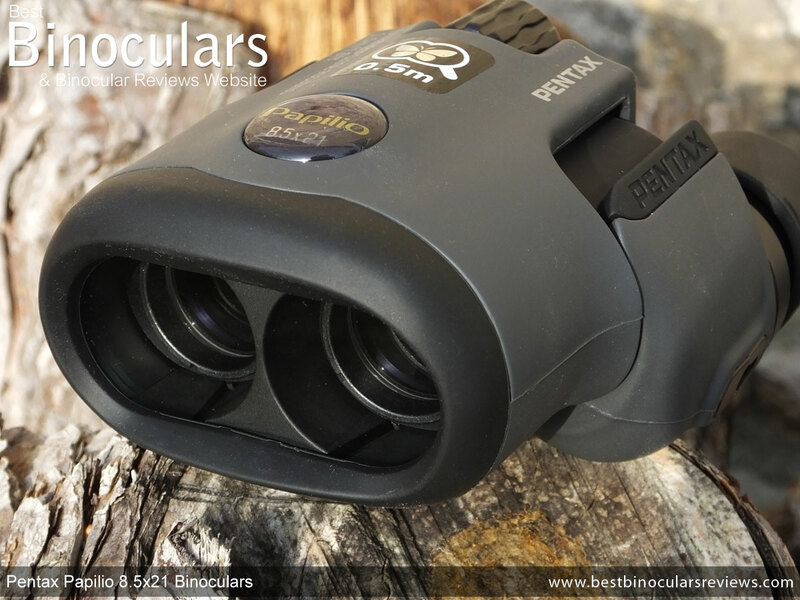 The image produced on what is essentially a low cost compact binocular is overall very good and compared to others in this size and price range, it is excellent. Sure the brightness and quality may not match that of a quality full sized 8x42 binocular, but what compact can? One thing that is for sure is when you focus up close on an object of beauty like a butterfly or flower, these Papilio's really do them justice as not only can you observe very fine details in a pin sharp focus, but the colors look incredible and you will see things that you would never otherwise have noticed. Obviously what immediately stands out is just how much shorter the Papilio's minimum focusing distance is. Also worth noting is that in this price range, just like the Papilio's none of the other compact porro prisms are waterproof. The Pentax Papilio also comes with Fully Multi-Coated optics, whilst almost all the others are only Multi-Coated or just Fully Coated. Just like the vast majority of compacts, the Papilio neck strap is thin and un-padded. As these bins are so small and lightweight this is obviously not a problem. The build quality looks good, but what I really like is the click lock system that they have for attaching the ends of the strap to the binocular. Not only is it MUCH quicker and easier to connect than the traditional way of threading the strap through a couple of loops on the binocular, but it offers a full 360° of movement meaning that the rest of the strap (especially the bit that goes around your neck) does not move about as much when you lift up the bins to your eyes. For a demonstration of this click lock system, take a look at the walk-around video at the end of the review. Once again and as with many compacts the Pentax Papilio does not come with any objective lens covers. You do however get an ocular lens cover which is otherwise known as a rain-guard. It is made from a flexible plastic,has a loop on the left cup that you can thread the neck strap through and has a bridge that is flexible so that it can adjust to what ever distance you set between the eyecups. However on the pair I had, the fit onto the cups was a little too loose for my liking as it would quite easily come away accidentally. Made from a faux leather the soft case has just about enough padding to offer a reasonable amount of protection to a compact like these. The shiny surface will also provide a good amount of cover from light rain. The case does not come with it's own carry strap. Rather you thread the nick strap from the binoculars through the sides of the lid to carry it whilst it is inside. Or if you prefer to carry the case on your hip, there is a belt loop sewn into the rear of the case (see the walk-around video below). There are no extra pockets either internally or externally and the binocular fits very snugly inside. In fact I would say that the fit is probably a little too tight as it is quite difficult to fasten the lid closed when you store the bins inside with the eye-cups twisted out and the the rain-guard on. As with many compacts, no lens cleaning cloth was supplied with the pair I was testing. However, whilst it is nice to have one, I recommend that you should get a decent optic lens cleaning kit anyway to make sure that you don't damage any of the lenses and their coatings during cleaning. The Papilio owners manual is fairly basic with details on how to adjust the eyecups, diopter, IPD, fix it to a tripod and attach the neck strap in a wide selection of languages. 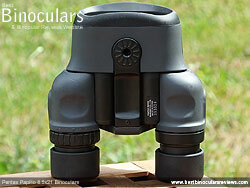 Also included is a small table with the main specifications of both the 8.5x21 and the 6.5x21 Papilio binoculars. Also stored within the box are details on the very generous looking European 30-Year warranty as well as the PENTAX Worldwide Service Network should you need to contact them in your location. I am sure that should you order them in other regions like the US, you would get an equivalent warranty included. 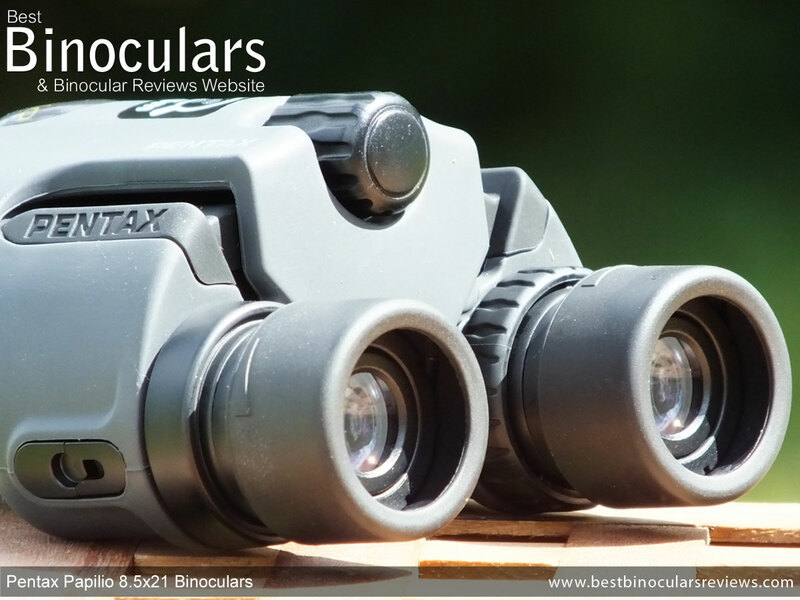 Strong Points: As a binocular that is designed to view something in great detail from a very close range, these are great and way better than any other close focusing binocular I have ever used. The colors produced are vivid, yet natural looking and the image is very sharp and flat with almost no distortion until you get right to the edges of the view, which considering the price is very impressive. 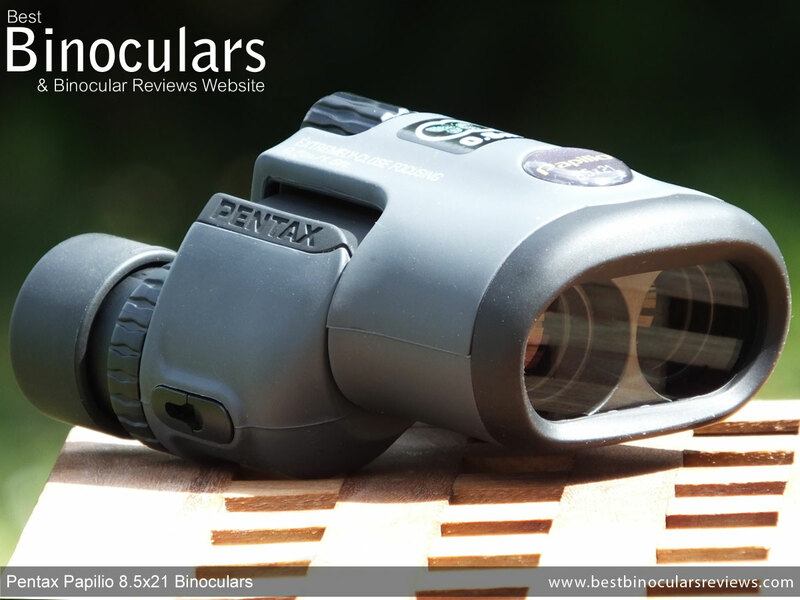 In keeping with all the other Pentax binoculars I have used, I also thought that the build quality on these was very good and from the look and feel of them it is difficult to believe they cost a little as they do. The fine focus is excellent, which makes it very simple to get a pin sharp image no matter what distance they are from you. The field of view on this 8.5x21 Papilio is also very good for a compact bin, especially when you consider that their magnification is a little more powerful than the more common 8x. Weak points? Whilst the carry case is pretty much as good as most other compacts in their price range, it does fall a little short when compared to the quality of the actual binocular. The fact that it is difficult to close the lid with the eye-cups extended is also a little annoying. The rain-guard also comes away from they eye-cups a little too easily for my liking and whilst many compacts don't have any lens covers, I wish it has some sort of cover to protect the objective lenses. Them not being fully waterproof or fogproof is a little disappointing, but once again is not uncommon for a binocular in this class. Ideal Uses: Obviously these are perfect butterfly binoculars and ideal for the close observation of things like other insects, flowers and birds and I have heard that bee-keepers use them to take a better look at the condition of their bees and they are ideal to take to a museum where you often want to view an object or even painting in fine detail. However if what you want to view from close range is fast moving, you may opt to sacrifice some of the image detail in favor of a wider field of view and get the 6.5x21 Papilio instead as this will make it easier to find and keep track of the critters! As a bin for most outdoor spectator sports they will work well and for me they are a great binocular to take on a hike or go camping with as they are small, light and you can use them to view flowers on a trail one moment and the very next, check out some wildlife on the plains or even an eagle high up in the trees. Great Value For Money? - Absolutely, for a binocular at this low price to have such a good build quality and perform optically as well as they do means that in my opinion, not only are they good value, they are great value for money. Overall - I am a big fan of these and in my opinion, the Pentax Papilio 8.5x21 performs well above it's price tag. As a general use compact they are pretty much as good as most ones in this price range out there, but for anyone who wants to take a more detailed look at some of the smaller, closer things around them these are really excellent. 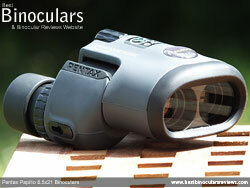 I would like to say a quick word of thanks to Pentax UK for organizing and sending me these Papilio binoculars to review. This as with all the reviews on BBR is completely my own opinion of the product and I have not been influenced at all to write in a particular way. 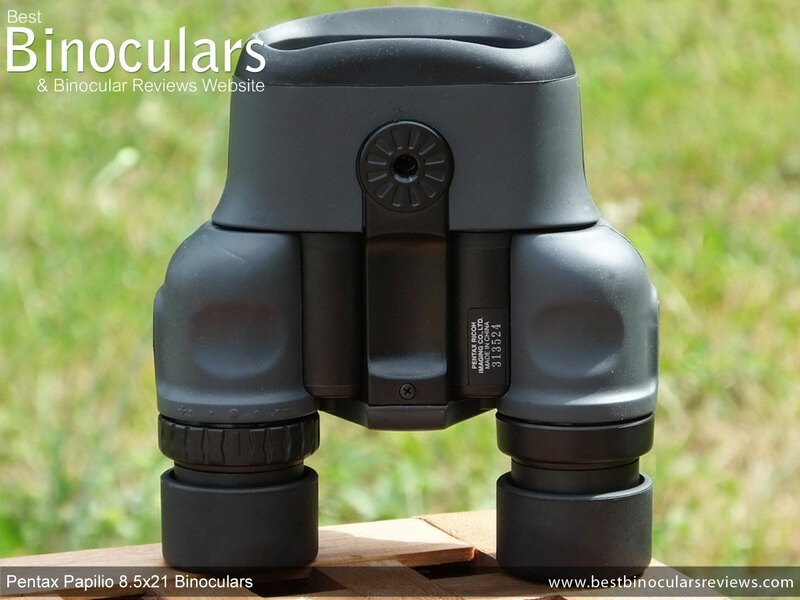 I would also like to assure you that unlike some other websites that simply make up a review based on the manufacturers marketing material and have never used or even seen the binocular in question, I spend more than enough time using, testing and comparing every binocular before I review them, both in my office and out in the field. Very high quality compact roof prisms that are fully fog and waterproof. 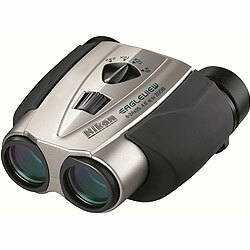 Also featuring fully multi-coated optics and phase correction coatings.